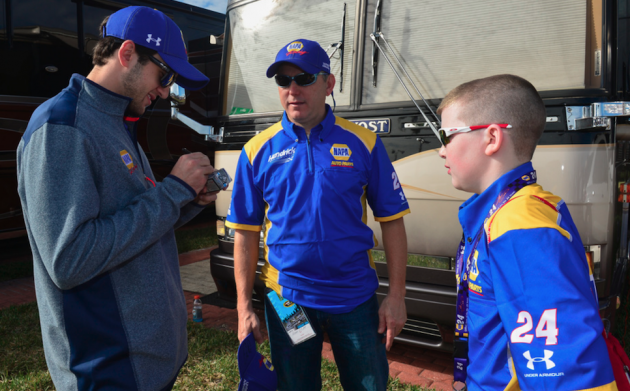 Crew chief Alan Gustafson and the #24 team of Chase Elliott allowed me behind the scenes for the last race of the 2016 NASCAR season. I found out leading a race team is a lot like running a business… except for the fact that millions of fans examine your every move. By now I was used to all the young ladies in denim skirts and cowboy boots, their eyes shining and smiles quivering with hope, who kept asking me to introduce them to Chase. I was used to older women clutching binders filled with 8 x 10 photos who kept asking if I would please get Chase’s autograph. I was used to fathers wearing NAPA, 3M, or Mtn. Dew, or Kelley Blue Book gear — all are sponsors, so if you want hats, shirts, jackets, die-cast cars, and even pajamas, you’re in luck because NASCAR sells at least a hundred different Chase-branded items — who kept asking if I could get Chase to pose for quick photos with their families. So I could sense the scrutiny when practice finished and I climbed down from atop the #24 hauler in the garage area of the Homestead-Miami Speedway. Moments earlier I had been standing a few feet away from team owner Rick Hendrick and Jeff Gordon, the four-time NASCAR champion and television commentator. His shoulders slumped, but then he stiffened with apparent resolve. “Shoot, I’ll just ask,” he said. “I’m a mechanical engineer. I’m a gear head. I love racing.” He took a deep breath. “Do you think there’s any way I could meet Alan?” he said, nodding his head in the direction of the hauler’s doorway. And although every Cup-level crew chief has clawed his way to the upper echelon of the industry, above that level are the handful of crew chiefs who work for the premier teams: Hendrick Motorsports, Joe Gibbs Racing, Team Penske, and Stewart-Haas Racing (or at least the Kevin Harvick “division” of S-HR). For a crew chief, those positions represent the true summit of the sport. Yet as is the case with most achievements, there are downsides. That’s great advice when you’re playing the film version of Oakland A’s general manager Billy Beane, but totally unrealistic when you work for Hendrick Motorsports (HMS) and every decision is subject to intense scrutiny by the media — and by fans who believe their favorite driver can do no wrong. The question comes with the territory. if you want this job, you also must accept that your skills will often be questioned. If you want this job, you must also accept that your leadership skills will often be questioned. If you want this job, you must also accept that your decisions will constantly be questioned. It’s an unremarkable conference room. Industrial gray carpet, a series of tables arranged in a large rectangle, fluorescent lighting, largely bare walls. You could be anywhere in corporate America. Most leadership teams don’t wear pants, shirts, and jackets displaying the logo of a corporate partner, Under Armour. Most leadership teams are not the Apple, Google, or Amazon of their respective fields. Most leadership teams don’t assemble some of the best engineers, machinists, mechanics, and strategists in the business to achieve a goal that can be approached but never achieved: To make a race car go as fast as it possibly can. 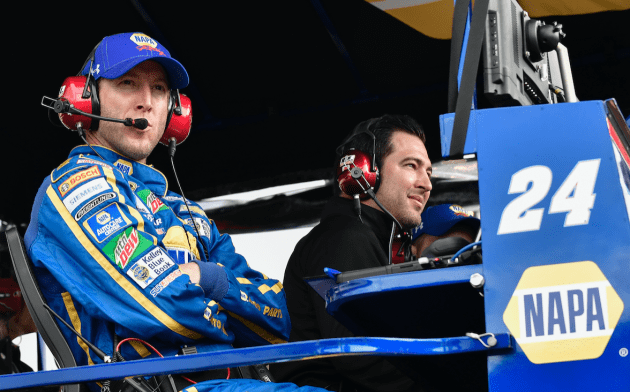 And that’s because you’re sitting where outsiders never do: in the Tuesday morning manager’s meeting for the #5 car of Kasey Kahne and the #24 of Chase Elliott… and you’re shadowing Chase’s crew chief, Alan Gustafson. What you’re about to learn is that running a race team, for all the experimentation, testing, computer modeling, and brain power required, still has more to do with leadership skills than hard skills. At HMS, hard skills just get you in a door — a door, not the door. Soft skills are what turn a collection of talented individuals into a great team. Soft skills turn knowledge, skill and experience into fast stock cars. Soft skills create the true foundation of championship organizations. But there is nothing stock about a “stock car.” Stock cars resemble street cars only in that they have an engine and four wheels. Hear the acronym “NASCAR” and you might picture tomato sandwiches, chicken fried steak, buttermilk biscuits and sausage gravy… but stock car racing long left its good ol’ boy roots in the rear-view mirror. At the highest level of the sport, good ol’ boys (except possibly in spirit) need not apply. While in NASCAR the cars are not as complex as those in Formula 1, where last year it cost approximately $80 to $100 million just to be competitive (and the Mercedes team reportedly spent nearly $300 million), in a way that makes the challenge even more daunting. Rather than searching for groundbreaking technological shifts, like Braun’s revolutionary rear diffuser design that led to a championship season in 2009 and left other teams scrambling to catch up, a NASCAR team must search for small, incremental gains — say, applying slightly thicker decal striping to increase downforce by a fractional yet meaningful amount — that in aggregate will result in a slightly faster car. That’s why many NASCAR races are decided by tenths or even hundredths of a second, while most Formula 1 races seem like a procession of cars led by two silver Mercedes. But in meetings — as in life — authority does not automatically confer intelligence. Nor does heavy-handedly exercising authority foster a sense of empowerment and teamwork. Both are things that Alan and Keith Rodden, the crew chief of the 5 car, clearly appreciate. Alan and Keith submitted post-race feedback notes ahead of time, as did their respective car chiefs, Josh Kirk and Todd Devnich. Steve uses those notes to run the meeting and debrief the previous Sunday’s race at Phoenix. The list of items is surprisingly short. At a micro level, the measurements discussed are extremely small; if football is a game of inches, racing is a game of sixteenths and thirty-seconds of an inch. At a macro level, listening is clearly more important than talking, and understanding is more important than impressing. For all the time and effort that went into preparing for it, last Sunday’s race at Phoenix now only matters in how it can be dissected to reveal areas for improvement. Then the discussion shifts to plans for the season finale at Homestead, as well as plans for the next year. Without getting too technical — if only because I’m incapable of getting too technical — the new chassis specifications will create changes in how the 2017 cars will be constructed. That’s business as usual, though: Cars are constantly under development, whether because of rule changes or because of improvements discovered by the different HMS teams.Improvements to one area of the car almost always creates problems in another. A single change to the chassis or body can create a ripple effect on build and overall performance. And that’s when the room loosens up. Ideas are proposed, considerations weighed, possibilities discussed… yet the focus stays on the idea, not the person. I don’t detect any agendas or interpersonal issues. Everyone just wants the cars to be faster. Even with the extensive rules NASCAR enforces — current regulations run hundreds of pages and are updated on a seemingly constant basis — possibilities for potential improvement are endless. Although HMS is an organization with enviable resources at its disposal, deciding what not to work on is as important as deciding what should. So is making decisions and moving on. A hood fit issue on the 24 appears to be a problem without a quick fix. Unlike the relatively over-built hoods on street cars, a race car hood is thin, flimsy sheet metal. Prop the hood up for too long and it can sag in the center. The hood on the car used at Phoenix sagged enough that it fit poorly on the cowl support, breaking negative air pressure and impacting aerodynamic performance. In time the group appears to reach consensus on how to address the hood issue, yet Alan lets that conversation end without resolution. I’m surprised. When I worked in manufacturing, closure was king. Of course he’s right. High performing organizations are often built by optimizing processes and procedures… but every task doesn’t deserve a best practice or a micro-managed approach, especially when the goal is to build teamwork. Plus, engagement and satisfaction are largely based on autonomy and independence. I care when something is “mine.” I care when I’m in charge and feel empowered to do what is right. And freedom breeds innovation. Even heavily process-oriented tasks have room for different approaches. That’s why smart leaders give their employees the autonomy and independence to work the way they work best. Micro-managing isn’t sustainable for many reasons, chief among them the overwhelming mass of information that must be synthesized and the countless decisions that must be made over the course of the longest season in professional sports. The NASCAR race schedule runs from February to November with only a handful of weekends off. And the offseason itself isn’t really “off”: testing, development, adapting to rules changes, preparing cars and finalizing logistics and making plans for the next season… there is no downtime. A successful crew chief must constantly balance control and empowerment, knowledge and trust, an uneasy equilibrium made even harder by the relentless pressure to perform. Alan speaks first, recapping the weekend at Phoenix. The car was good in practice and they almost won the pole: Chase qualified third, five-hundredths of a second behind from pole-winner and teammate Alex Bowman. (Alex subbed for Dale Earnhardt, Jr., who is recovering from a concussion.) They started the race well and decided to pit early in the first run to take advantage of fresh tires and hopefully gain a second or so per lap on the leader, but a caution flag caught them in the pits. They fought their way back through the field, gambled by changing two tires instead of four on the final pit stop, but eventually finished ninth. Up next is general manager Doug Duchardt. Doug is responsible for overseeing all competition-related departments: teams, engines, chassis and body construction, engineering, research and development, and pit crews. He reminds everyone to make any year-end employee benefits changes and announces a pep rally will be held on Wednesday for the 48 team. It’s natural to assume that racing is somehow different from “normal” businesses, but in most ways, it is not. There is a need to perform; the main difference is that victories and defeats play out on a public stage. There are goals to focus on, metrics to track, careers to nurture and develop, except many of those aspects play out publicly as well. Success is rewarded and failure is punished… except the line between success and failure in this business is razor thin. Each week there is only be one winner. Thirty-nine other teams are left to wonder what happened — and what they can do differently the next time. But that is also business. Maybe what makes racing different is that most of the people involved genuinely love the sport — or at least love the work that goes into the sport. Still, Alan says he doesn’t work as many hours as he once did. While a few races sprinkled throughout the year are run on Saturday nights, Sunday is typically race day. The team flies back after the race, meaning he gets home as early as 7 p.m. or as late as 2 or 3 a.m. Mondays he gets to the shop by 8.30 or 9 a.m., Tuesdays and Wednesdays by 7 a.m. He generally doesn’t leave work until 6 or 7 p.m., sometimes later. Thursday afternoons are typically reserved for travel to the next track. In years past he worked Thursday mornings, but more recently he’s taken those few hours off to spend time with his family or mountain bike or paddle board. Fridays, Saturdays, and Sundays are spent at the track… and then the week starts all over again. Yet he claims he doesn’t work as many hours as he once did. That’s why great bosses make it extremely easy for employees to offer suggestions. They ask leading questions. They probe, but gently. They make employees feel comfortable proposing new ways to get things done. When an idea isn’t feasible, they take the time to explain why; other times they use silence as a tool to spark discussion. That’s how Alan runs this meeting. Another surprise is the nature of conversations about other Hendrick teams. I’m accustomed to overt competition between facilities and even departments. I once worked at a dog-eat-dog plant where intra-department competition was encouraged and “winning” was a zero-sum game. Here the spirit is collaboratively competitive. The 24 team never talks about what other teams don’t do well — they talk about what other HMS teams do well that they can learn from. “Teamwork” is clearly than just a bullet point on a mission statement. They want to out-run their stable mates because their car is better, not because the other teams’ cars are worse. During the race, spotters assume a perch high above the track and serve as the driver’s primary point of communication. Once spotters focused primarily on safety, letting the driver know when others cars were in the driver’s blind spot and alerting them to crashes. Today’s spotters pass on information about other cars, suggest lines that are working for other drivers, identify rubber buildup on the track… in short, a spotter serves as an additional set of eyes for the driver and an additional source of data for the crew chief and engineers. After each race Eddie prepares reports that include his impressions, post-race video analysis, and suggestions for improvement. Today his input is especially valuable since Chase’s plane has been delayed by fog. And they’re probably right… but the 22 car of Joey Logano won the race after Matt Kenseth wrecked in overtime and took out the 88. Fast is fast, but racing is racing. The fastest car often doesn’t win. What perplexes the group is why the car performed relatively poorly near the end of the race. Hopefully Chase can provide insight that helps them better understand why the car’s performance fell off. NASCAR pit crew members don’t work on the cars. They aren’t mechanics, they aren’t engineers (although some have engineering degrees), they don’t work in the shop. They’re athletes. One example: Rowdy Harrell, a tire changer for the 88 team, won three National Championships as a linebacker at the University of Alabama before being recruited for the HMS pit crew development program. How much? Math isn’t my friend, but I do know that a tenth of a second lost in the pits translates to almost thirty feet on the racetrack for a car going 200 miles per hour. Losing a half-second in the pits can mean falling from first to tenth — or worse, at super speedways like Talladega, where cars tend to circle the track almost bumper to bumper. The meeting starts with a video review of pit stops from the Phoenix race. Each of the six pit crew members — two tire changers, two tire carriers, the jack man and the fueler — wear helmet-mounted GoPro cameras. GoPros are also mounted on arms suspended over the pit box. Every stop is reviewed from all angles. Chris Burkey, their pit crew coach and ex-scout for the Miami Dolphins, reviews each stop from a group perspective as well individual. But Alan also jumps in; while Chris is responsible for the crew’s performance, Alan calls the “plays” on race day, deciding whether to replace two tires or four as well as what adjustments to make to the car. That means his decisions affect the crew’s individual movements and overall choreography. Pitting a car comes down to human performance: strength, speed, power, agility, eye-hand coordination… all must come together for a stop to go well. Then there’s the mental aspect. Confidence is critical when you have to perform under extreme pressure. Pit crew members are mostly former college athletes accustomed to performing in critical situations in front of large crowds, but still: Spend too much time analyzing an individual’s mistakes and you chip away at his confidence. Then again, fail to provide constructive feedback and you reduce the chance for improvement. Alan makes a few comments, but he mostly looks to the group for input and solutions. Ultimately they’re a team, and great teammates are not just skilled at their jobs but also at making the people around them perform better. The conversation then shifts to Homestead. The pit boxes there are relatively large, which is a good thing, but the pit wall is both taller and wider, which makes jumping off to service the car more challenging. They review video from pit stops of last year’s race at Homestead and chuckle appreciatively when they remember how then-driver Jeff Gordon managed to stop the car at the same spot nearly every time. The meeting ends with a summary of what to expect in terms of race strategy for Homestead, a track tires wear quickly and lap times steadily drop off. Alan plans to stay “short” on fuel, meaning he’ll likely pit the car to change tires long before it will need to be refueled. That, plus the likelihood of caution flags due to crashes, should result in plenty of pit stops. The crew also must be prepared to deal with damage to the right side of the car, since running inches away from the wall — which unfortunately means sometimes scraping it — is often the fastest way to circle the Homestead track. And with that the crew heads off to the HMS athletic facilities, a gym, turf field, and training center on par with those provided by professional sports teams… which makes sense, since pit crews are professional athletes. The next meeting is for the engineers and Josh, the car chief (if a crew chief is like a CEO, the car chief is the COO.) It’s a relatively young group, less corporate but more tech-y. He also loves to delegate. Alan quickly moves from one bullet point to the next, listing a problem and then stating a solution. While a looser meeting, it’s also an implementation meeting: problem, solution, accountability. But delegation is only effective after you’ve built a team of skilled people you can trust. If you run a company, you don’t need a Director of Sales; you need a person who loves helping other people sell more. You don’t need an Engineering Manager; you need a person who loves creating new products. You don’t need a Supervisor of Whatever; you need a person who long ago made the choice that his or her happiness comes from someone else’s success and who thrives on working through other people to get important things done. That’s why Alan promotes based not just on skills but also on personality, attitude, work ethic, drive, and attention to detail. Skills can be learned. Attitude can’t. The 24 team, and the Hendrick shop in general, functions as a meritocracy where people are promoted if they deserve to be promoted, regardless of seniority or conventional career path. If you excel, there is room for you to grow. Yet he’s also comfortable in the knowledge that this group, like the others, is extremely capable, which lets him focus on coordination and collaboration. Ultimately his job, like every leader’s job, is to make the most important decision: deciding who is the right person to make different decisions. Decisiveness is a quality every good leader possesses. The best leaders are decisive on an even higher level: They realize they sometimes are not the best person to make a particular decision, so they decide who is. Once the list is complete, a few people leave. The rest watch videos showing last year’s qualifying sessions at Homestead. Some are a digital composite blending different videos to make it seem like two cars were on the track at the same time; the result shows where each car ran on the track, and which was faster or slower by comparison. While Jeff Gordon was the driver last year, he’s rarely mentioned. What he did then is interesting but irrelevant to their purposes now; they’re responsible for giving the driver — whomever that might be — a fast car. They act on the assumption that the driver did the best he could with what he was given. If he is slower than another car, it’s their fault. They haven’t given him the tools he needed. So, because NASCAR doesn’t allow comprehensive telemetry on the cars, the engineers rely on tests, practices, and race results for one set of data. Then they run simulations to test hypotheses and generate another set of data. That means sometimes a car will be fast… yet they aren’t 100% sure why. Other times a setup will not work, and they can only make informed guesses as to why. When you’re dealing with fractions of an inch and fractions of degrees of angle and changing ambient temperatures and track conditions, uncertainty is a given. That’s why performance tends to run in cycles. A team’s fortunes tend to ebb and flow from season to season and even within a season… but is also why an organization like HMS has been so successful over a number of years: they have more smart people working as hard, if not harder, than just about any other organization. But there’s a self-imposed downside. HMS shares the results of all that effort by building engines and chassis and parts for other — competing — teams. Want to run a Hendrick engine? You can — and it will be identical to the engines they run. Want to run a Hendrick chassis? You can — and it will be just as good as the chassis their cars use. In many ways, HMS does the heavy lifting and leaves the fine-tuning to their customers — who, again, are also their competitors. You could argue that gives other teams an advantage since they can focus their time and effort on making incremental improvements to already outstanding equipment. Or you could argue that HMS maintains an advantage because they better understand the fundamentals of what they build. Should you buy technology, or build it yourself? Both are viable, but building — and selling, which also means sharing — is the Hendrick way. And you certainly can’t argue with the results. The discussion immediately jumps back the race at Phoenix; the team is obviously eager to hear his thoughts. Numbers are important, but only the driver can provide subjective feedback on how the car performed. Turning “feel” into practical terms is an essential skill; a driver who can’t describe what the car is doing is a driver who will never reach the top level of the sport. “Starting the first run the car felt a tick free at times, maybe off at times, then in the middle of the run felt good. Late in the run Jimmie was mowing them down. Entrance was good but it seemed like he had to wait on the center and lost ground. That’s why he wanted to free the car up a tad. After the first pit stop he felt that was the best the car was all day: the car turned better across the middle and drive off was better and security in didn’t change. After 10 laps, when traffic sorted out, he could roll. Alan interjects to say, ” It didn’t seem like you could get off Turn 2 very well.” Chase agrees. Alan decides to look at set-up data for the other Hendrick cars, especially Johnson’s 48 and the 88 of Alex Bowman, to see if there were differences that could explain why the 24 fell off. They then discuss different lines used in the corners, as well as diving down onto the apron at Phoenix. Chase wishes he had started using the apron sooner; he was behind Kyle Larson in the 42 when he started to use that line, and the lack of clean air negatively affected his car’s handling. Chase also talks about what he saw other drivers do, especially Jimmie Johnson. Johnson and his team are the gold standard, the six-time champions (soon to be seven) a natural benchmark. Still, having superstar as a colleague is both blessing and curse: You’re in a great position to learn from the other team’s success… but you also can’t help but be compared to them. Speaking of comparisons, at this point I realize I’ve seen Alan use at least four different communication styles. Great leaders change their communication style to suit the needs of different audiences. In the manager’s meeting Alan was in “peer” mode, always collaborative and never authoritative. During the whole-shop meeting he was in “teambuilding” mode: informing, motivating, and recognizing everyone in the shop for a season’s worth of effort. During the car and engineering meetings he shifted to “CEO” mode: listening, evaluating, questioning… yet not afraid to make decisions and assign tasks and responsibility. He’s direct, but with a light touch. With Chase his touch is even lighter, like a coach working with a relatively inexperienced (Chase is only twenty-one years old) yet hugely talented athlete. He and Chase work so closely together — and must trust each other to such an exceptional degree — that maintaining a good relationship is paramount. Chase asks what they might have done to make the car even better during his best run. Alan asks questions about brake settings (seemed fine), about brake chatter (there was none), how Chase felt the car responded to some of the changes they made during pit stops (no real improvement), how only changing two tires impacted the car’s balance (negatively), how the car felt on restarts (fine), issues with the sun (it’s always hard to see at Phoenix when the sun is low on the horizon, but this race was no worse than usual). During a race Chase literally has his hands full, so relatively little information can be exchanged. The first half of this meeting is the entire team’s only real chance to take a detailed look, as a group, at the past race to decide what to do differently in the future. Ultimately Chase is confused and frustrated by how the car fell off. He feels good about how they dug themselves out of a hole and put themselves back into position near the end of the race. Alan thinks they should have used a different caliper/brake pad setup and a set of shocks with greater high-speed compression. In a sport with an infinite number of variables, hindsight will always be a combination of accuracy and speculation. An old management cliché says you need to know what you don’t know, but in racing you can never truly know what you don’t know. They then replay the 2015 Homestead qualifying videos as well as last year’s TV feed from the final round of qualifying. The focus is on possible lane choices for qualifying, because those decisions will affect how the car is set up for qualifying. Before Chase arrived, Alan had decided that approach made the most sense. Yet he didn’t say so; he talked about possibilities, asked questions, let Chase watch the videos… and Chase came to the same conclusion. As the meeting winds down the conversation shifts to the 2011 Homestead race. Low-key until now, Chase lights up as he talks about watching a replay on NBCSN the night before of Tony Stewart winning that race, and with it the 2011 championship. It’s a telling moment: The team’s waking hours are consumed with racing, but at heart, they’re still fans. And maybe that’s another reason why they’re willing to work so hard. When you love your job, it isn’t work. Desk, credenza, small conference table, photos of his family… Alan’s office looks like that of a manager in just about any organization — except his office also contains trophies, pit crew helmets from years past, and photos of visits to Victory Lane. His desk indicates he’s a leader who spends much more time on the shop floor than in his office: papers, files, binders, random objects, and a few management books he would evidently like to read but has never found time to even crack open. I ask whether there is a difference in how he prepares a car for individual drivers. There is… but not really. It’s an interesting concept, one that takes me a moment to absorb. The myth among many is that the crew chief must build a car perfectly suited to a driver’s unique style. That is only partly true. Alan’s job is to build the fastest race car possible; how it goes around the track is interesting, but how fast it goes around the track is everything. Whether a driver is “comfortable” with a car is largely irrelevant. It’s the driver’s job to manage the car he is given. Good drivers may complain about the way a car handles, but ultimately they want to win. Give Chase a car that is hard to drive, yet one he can find a way to drive faster than every other car on the track, and he will finish the race a tired but happy man. Since he has such a talented driver, Alan’s job is to build a car that will go as fast as possible, whatever that means, and then leave it to Chase to manage the car. If I was driving then Alan would need to set the car up so I would feel comfortable… but what feels comfortable to someone like me would not be fast. A great driver can take a fast car and drive it the way it needs to be driven to maximize its potential. On the flip side, many fans assume it must be the fault of the car when their favorite driver loses. Members of, say, Junior Nation clearly believe that Dale Jr. is the best driver in the world… so when he doesn’t win, it must be the car. In some ways being part of a four-car team makes the search for perfection a little easier. I ask about how the process for how innovations are shared among all the teams. But decisions made by committees tend to regress to the mean: groups mitigate the impact of bad ideas but also blunt the edge of revolutionary ideas. The larger the group, the greater the regression. While implementation may take place more slowly at an organizational level, the HMS approach means the total number of innovations generated is much higher — and in a sport where success is based on the aggregate of incremental gains, the greater the number of innovations the better. That approach requires a deft management touch, though, with a team and a driver. Alan’s job is to help present information and let people come to the right conclusions, whenever possible guiding rather than directing. He provides as much detail as each person can handle, knowing that over time they will develop the ability to take on more, and more, and more. Even at the top level, people must be developed. That’s how individuals and organizations grow. But there is always a bottom-line imperative in play: what you do must result in more speed on the track. If it doesn’t, what’s the point? That premise is true in manufacturing, in distribution, in any task where efficiency is important: “Better” is only better when it results in measurably greater output, improved quality, less spoilage, etc. Alan’s job is to constantly search for speed and reliability, and any effort that doesn’t result in speed is a waste of time, because time matters. Routine is more important than ever for the 48 team since so much is on the line — and “normal” will cease to exist once the team arrives at the track. Earlier Alan talked about all the energy that surrounded Jeff Gordon’s last race: not only was Gordon retiring (at least he intended to) he was also still in contention for the championship. The throng of media and fans surrounding the team’s hauler made it impossible for the crew to go directly from there to their pit box; they had to circle around behind other trailers to avoid the crush. Then, during the race Alan happened to glance at the row of seats behind him to see Mario Andretti and three-time Formula One champion Lewis Hamilton. The minute the 48 team arrives at Homestead, “normal” will be hard to find. Alan could have cut the conversation short by saying, “That’s great. Do it.” But he doesn’t. A quick pat on the back is nice, but the best recognition often comes from being heard. When another person — especially an incredibly busy person — gives you their time and full attention, you know you matter. Inside, the first thing you notice is the noise. In NASCAR the car’s exhausts are unrestricted. (The more easily air flows through the exhaust, the more power it can make.) The second is the constant activity. It’s a trite comparison, but a NASCAR garage is like a beehive filled with the hum of constant and purposeful activity. But with success comes pressure. An HMS crew chief sits at the tip of the large spear of a massive organization: chassis, engines, suspensions, body, aerodynamics, parts, R & D, engineering… and with the position comes the pressure of knowing that your organization provides the best in resources. If you’re the head football coach at, say, TCU, the expectations are high — but if you’re the head coach at the University of Alabama, you better win championships. Anything less is considered failure. So if you want to make your living in racing, it’s the kind of job you want… as long as you also can accept the pressure. If the pressure weighs on Alan, it’s not apparent. He oversees his team’s activity, but for the most part stays out of the way. They don’t need constant direction. Each member of the team knows his job. If they don’t, Alan hasn’t done his job. A good crew chief keeps every member of his team feeling confident and empowered. Constant direction is overwhelming. Instead, he feeds in details to help enhance already excellent skill sets. The garage area is also filled with fans. NASCAR allows access that no other sport provides, nor would even consider. Imagine an NFL practice with fans clustered around the huddle and stepping in the way when receivers run routes during pre-game warmups. That’s business as usual for NASCAR teams. In return the fans are almost uniformly respectful: they watch and listen, but rarely interrupt. It’s as if they think, “It’s a privilege to be here, and I won’t abuse it.” The crews play their part in that dance. They know the fans are there… but then again, it’s like they don’t. Apart from the occasional, “Excuse me,” they stay in their bubbles. They have to. In practice there is time… but never enough time. You get the feeling crew chiefs would practice for days if they could, constantly experimenting and tweaking and learning. Racing is like a giant laboratory experiment, and the people who love it genuinely love the search for speed. They like winning, but they love the process. If you don’t love the process, you aren’t in the sport. Not at this level. Take Dave Ott, the hauler driver for the 24 team. Monday morning he left Phoenix and he arrived at the HMS complex in Charlotte on Tuesday. The team unloaded the truck, then re-loaded it so Dave could drive to Miami on Wednesday. On West Coast swings, when two or more races in a row take place in that region, the hauler may stay out and a swap truck will meet it to exchange parts and cars. Dave went from Texas to Phoenix that way. Early in the season the primary hauler may stay out for a month. No matter how long it’s out, Dave stays with it. Good hauler drivers make it easy for their crews to focus on their jobs. But that means Dave is the first to leave the shop and the last to return. This week the Hendrick teams flew from Concord to Miami on Thursday morning, the 5 and 24 teams on one HMS plane and the 48 and 88 on another. They will leave soon after the race, most of them getting home late Sunday night. Dave will make it home some time Monday. Throughout the race weekend he has many other jobs: ferrying equipment back and forth to the garage area, keeping the hauler organized, working with radios… and dealing with people like me. Dave has just handed me a headset when drivers start to appear in the garage area, like jockeys at a horse race. They quickly ease through clusters of fans seeking autographs, enter the bubble of their individual garage stalls, climb inside their cars, and strap up and go. The plan is already in place. Last minute words are largely unnecessary, aside from quick reminders. If you don’t already know what you need to know when you show up, you won’t ever know. Many of the drivers are slim and wiry. A few are burly, and some, like Carl Edwards, are built like defensive backs, but for the most part they have trained their bodies and minds to reflect their function: stamina, conditioning, reflex, and mental toughness. Chase Elliott, signing for fans. At 9.50 a.m. Alan climbs up to the top of the hauler. Doug Duchardt joins him. Practice starts, and the radio is quiet except for some occasional quick words from the spotter about traffic. Alan watches his team’s car circle the track at over 180 miles per hour. Even though the car is the result of hundreds of people hours and millions of dollars in development and spending, he doesn’t say much. He studies the car as it slides through turns 3 and 4 and glances down at the array of monitors before him. He seems to be evaluating the car, not the driver. Again, the assumption is that the drivers is perfect and the car is not: make the car better and Chase will go faster. The driver makes a difference, and the driver needs a car that allows him to make a difference. After about 5 minutes Chase comes back in the garage. Alan has a plan and the team executes that plan. Chase’s provides feedback. The discussion is brief. It doesn’t take many words to get across how the car is handling. Chase says the car is maybe a tick loose. But he likes the drive off the corners. And it carries speed into the corner well. Alan says he wants to help him get off the corner even better. They feel they have a strong car, but it’s not perfect. Racing is a series of compromises: what is good in one part of a corner isn’t so good in another part of a corner. I think of a turn as a turn: to a driver and crew chief, a turn is broken down into small segments, each with its own characteristics and opportunities. No car can do everything perfectly, so given a choice, what will you give up? While they talk, I study one of the monitors atop the hauler that displays a graph showing Chase’s lap times compared to a handful of select cars. At the start of the run Chase was quicker than the others. By the end of that run all the times were similar as tire wear evened the playing field. Still: he’s 2nd quickest overall. But there’s plenty of testing still to do. Practice is all about gaining knowledge. The goal is to gather data that will not only make the car faster but also help you Alan informed decisions during the race, all the while accepting he will never be perfect. Racing is the confluence of a myriad of combinations and factors, some of them random and ultimately unknowable. The car stays in the garage for seventeen minutes while the crew makes changes. Chase stays strapped inside the car, reviewing data on a portable monitor. When he goes back out onto the track he can run on the bottom of the track on newer tires but must to shift up to the top of the track as his tires lose grip. Running at the top is a risk/reward proposition, though. It’s riskier to run inches away from the wall at 150-plus miles an hour since one slip or bobble and the car will scrape the wall. That racing line is several tenths faster, but what risk do you accept for speed? Back atop the hauler, Alan watches and mentally catalogs. He doesn’t take notes; it’s all in his head. Later I realize he missed nothing: he knows what his car did, he knows what other cars did, where they ran well and where they didn’t… he reminds me of a chess Grandmaster who can play 20 games at once, keeping an image of all the boards in his head. Kyle Larson passes Chase late in the practice run. I raise my eyebrows and Alan shrugs: The 42 is on new tires. You go as fast as you with what you have. New tires aside, though, the 42 is strong. Alan says Kyle is particularly adept at running the high line; his dirt track experience pays off at Homestead. The 42 should be one of the cars to beat, and the fact Chase can run with him is a good sign. During the next stop Chase says his drive off the corners is still slightly off. Alan radios a few directions to the crew on what changes to make. Meanwhile Chase and Alan talk more about the top line. Making it work is the driver’s job, but it’s a difficult job. For the first time, it’s evident that Chase is only twenty-one when he says, “It’s so fast up there it’s stupid.” Fortunately, the pressures of the sport don’t seem to have aged him prematurely. Alan balances his impressions with Chase’s feedback. He relies on Chase, because only he can feel the car. But Chase can’t see everything. Crew chiefs, drivers, spotters, and data form as complete a picture of the car as possible. But there are many more variables: other cars, changing track conditions… so you never have sufficient data. You only have enough data to make smart guesses. In a way, it’s like the fog of war. Some people can see through the fog. Most cannot. the best engineers and crew chiefs have the uncanny ability to analyze a limited data set and still make great decisions. Or it’s like St. Augustine said: the best way to heaven is to know the route to hell, and then avoid it. Unfortunately, in racing the route to hell is usually only apparent in hindsight. Jimmie Johnson slips into their garage stall to talk with Alan and Chase. He already knows what he knows; what he doesn’t know is what they know. That’s the power of a multi-car team. While they huddle together, a crowd of fans surrounds the garage. Jimmie has a chance to be a 7-time champion, and Chase is a rising star — in a few weeks he will be named Rookie of the Year — with an outstanding pedigree. Meanwhile the engineers study their laptops, the videos guys review footage, and the mechanics inspect and evaluate. NASCAR racing will never be big data, but at HMS, it’s the biggest data the rules allow. When the second practice session begins, the 24 runs sticker (brand new) tires. The crew also made an untested modification. Unlike Johnson’s team, Alan can afford to be aggressive. If they were still in championship contention they wouldn’t take a risk on an untried setup. Jeff Gordon climbs up on the adjacent 48 hauler. Why not? He’s a part-owner of that team. He leans over to talk to Alan about the 24. They’re technically competitors, but teamwork always overrides competition. Plus they worked together, as driver and crew chief, for several years. Many of the other teams compete mostly against themselves. They’re not fast enough to win. As in every sport, the cream rises to the top, both in terms of organization and athletes. Better organizations get better results. The myth of the talented renegade is just that: a myth. A realistic hope for a mid-level team — barring an unusual combination of events, like when Chris Buescher won a rain-shortened Pocono race earlier in the year — is that they will perform better than expected and draw the attention of sponsors with deeper pockets. Use those funds wisely to perform even better, and hopefully you can continue the cycle. That’s how HMS did it. That’s how Joe Gibbs Racing did it. No one starts at the top. In essence, a race team is like a startup: results attract funding. As Alan and Jeff talk, Rick Hendrick joins us atop the 24 hauler. (Well, he doesn’t join me, but he does join Alan. I’m just glad he’s nice enough not to ask why I’m there.) By not going to the 48 hauler I’m not sure whether Mr. H hopes to avoid putting implied pressure on Johnson’s team, or simply stay out of their way. I scan the garage area while he and Alan talk. Mostly there’s a sense of controlled urgency. Teams that are frantic in the garage area are typically slow on the track, as if they’re searching for things they cannot and will not find. One thing the 24 has found is speed. In practice they topped 174 mph. When asked, Alan gives rates the car at a 7.5 out of 10, still feeling the 42 could be the car to watch. Even so: the 24 runs better down low early in a run. The 42 runs better up high late in a run. The race may come down to when the last pit stop occurs: if there are only a handful of laps remaining and Chase can take advantage of new tires to run the bottom line , the 24 could have the advantage. Great news: The 24’s pit stall is located just past that of the 15 car of Clint Bowyer. His team has not had a great season and is likely to be at least one lap down at some point in the race, and since cars a lap or more down are not allowed to pit with the lead-lap cars, the 15’s stall should be empty and will make Chase’s entry into his pit stall easier. Even better, the pit stall in front is empty: Exiting the pit box will be easier since there is no possibility of getting blocked in by another car. Chase should be able to drive almost straight in and out of his pit box. Coincidentally, the 15’s pit crew is actually a Hendrick development crew. Smaller teams “rent” pit crews from larger teams — or hire independent contractors — to keep their costs down and still utilize skilled personnel. After all, every member of a development crew is highly motivated to perform well. Their goal is to move up to first-string status and pit a Hendrick car. Working for other teams is a great way to gain valuable race-day experience and showcase their skills. Unfortunately, that’s it for great news. The green flag drops and for much of the day Chase runs somewhere around tenth place. The adjustments Alan makes during pit stops improve the car, but Chase still can’t run with the leaders. He tries different lines and Alan continues to make setup changes… but they can’t find more speed. That’s the problem with an actual race: You have what you have. You can try to improve the car, but any improvements will almost always be incremental. A race should be the celebration of tremendous effort but instead often results in helpless frustration: you can’t call time-out, can’t go back to the drawing board, can’t pivot… in small-town drag racing parlance, all you can do is run what you brung. With ten laps to go, the caution flag flies. Kyle Larson is the leader; as Alan predicted, he’s strong. All four championship contenders are in the top six — even Jimmie Johnson, who has somehow managed to claw his way into fifth position after starting the race at the back of the field. Edwards gets out of his car, shrugs off the ambulance, and walks straight to the Logano pit to shake hands with the 22’s crew before walking through the garage to the infield care center for evaluation and release. Chase was also caught up in the melee and sustained damage that requires two trips to pit road under caution, ruling him out of contention for the win. The race restarts with five laps to go and Ricky Stenhouse, Jr. spins out after less than half a lap, creating another caution. Johnson is now in second; he’ll restart the race on the inside of Larson. Behind them in third sits Logano, who has been particularly strong on restarts. Kyle Busch pitted under caution and now has fresh tires, but that also means he’ll restart the race a number of positions back. His only hope is that more cautions will help him leapfrog his way to the front. While the cars circled the track under the yellow flag I make my way to the start-finish line. The fans pressed around me all feel Logano will pass Johnson. Jimmie’s car is fast, but not that fast. They think the 48 is a sitting duck. Tomorrow Dave will drive it back to Charlotte. The team will fly back tonight. In the days to come, they will all enjoy some well-deserved time off. After all, that’s the job.